Some say humans are the most adaptive species on earth and during economic downturns, this trait helps us figure out ways for our businesses to manoeuvre the challenging market environment. According to property consultancy firm Knight Frank Malaysia’s Real Estate Insights research report, the challenging property market has led developers to adopt “push marketing” in order to boost sales of their projects. Among the notable ongoing marketing campaigns is Sunway Group Bhd’s “Sunway Property Certainty Campaign” that offers up to 88% financing. Others include IOI Properties Group Bhd’s deferred payment scheme of 18 to 24 months for the usual lump sum down payment, and S P Setia Bhd’s 10:90 scheme where buyers need only pay a deposit of 10%, with the remainder payable after the property is completed. S P Setia president and CEO Datuk Khor Chap Jen said the 10:90 scheme, which is applicable to selected Setia properties, is a way to show that such programmes can co-exist with sell-and-build schemes. “S P Setia has always advocated these kinds of schemes which allow the market to decide the kind of scheme that they want to go for when it comes to property purchases,” he said at a press conference during the launch of the Citizen Setia customer rewards and appreciation programme on Sept 5. According to Khor, the 10:90 scheme has been very well-received especially among buyers of higher-priced properties. “Maybe because many of these purchasers are upgraders, so they need more time to facilitate the whole house-selling process (for their current homes),” he concluded. Eco World Development Group Bhd (EcoWorld) also took the opportunity to “excite” its buyers with special rebates starting from July 15 to Sept 16. Repeat buyers enjoy a total of 4% rebate when they purchase their second EcoWorld property. Also, when a referrer makes a successful introduction, the person will get a total of 3% off the property’s selling price. Meanwhile, new buyers will receive a 2% rebate on top of other ongoing promotions. Its president and CEO Datuk Chang Khim Wah said much of EcoWorld’s RM1.315 billion sales achieved this year as at May 31, 2016 have been contributed by numerous group-wide and localised marketing campaigns, including special packages such as the EcoWorld Prestige rebate packages for both existing and new purchasers, and customer-engaging events such as the Seasons Flower Show, Colours of Spring Festival, Yokoso Japan @ BBCC and Hallyu Korea @ Eco Sky that were held from January to May 2016. “These [customer-engaging] events successfully drew huge crowds of visitors to the various project sites, thereby significantly increasing EcoWorld’s customer database,” he told TheEdgeProperty.com. “The marketing momentum continued in June 2016 with group-wide celebrations of the World Environment Day and the innovative EWRO Fest, launched in conjunction with the European Football Championships, which saw each of our projects promote a different European country. “These are some of the efforts in creating a distinctive edge for ourselves in these trying times and we are thankful to be able to grow our brand name at the same time,” he added. 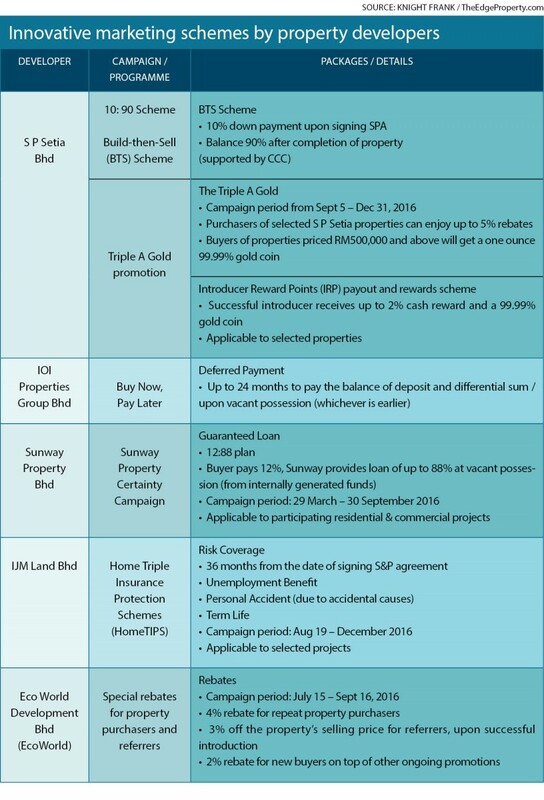 Meanwhile, IJM Land Bhd has introduced the Home Triple Insurance Scheme (HomeTIPS), enabling Allianz Malaysia Bhd to underwrite three insurance schemes for IJM Land homebuyers for 36 months from the date of signing of the sales and purchase (S&P) agreement, at no additional cost. HomeTIPS is applicable to homebuyers of selected IJM Land residential projects with selling prices ranging from RM300,000 to RM2 million, purchased directly from IJM Land from Aug 19 until December 2016. IJM Land managing director Edward Chong told the media at the unveiling of HomeTIPS recently that this is the first scheme of its kind to be offered by a Malaysian property developer. “We believe in building not just homes, but relationships. We want our homebuyers to be confident with the fact that should something untoward happen, IJM Land is able to help secure the roof over their heads with this unique insurance scheme underwritten by Allianz,” he said. But how do buyers decide when faced with such “attractive” schemes? Speaking from a consumer’s perspective, chief operating officer of Henry Butcher Real Estate Sdn Bhd Tang Chee Meng told TheEdgeProperty.com that buyers should be aware of what’s presented to them. “It is important for buyers to really like the location and the property that he or she is buying and not just be lured by the schemes offered by the developers. “The buyer should also check around to make sure that he or she is not being made to pay extra for what he or she is buying. “Lastly, he or she should buy from a reputable and financially sound developer who can complete the project and not abandon it halfway because of slow sales,” cautioned Tang. So do such “push marketing” schemes really help developers boost sales? Tang said some developers who have offered such schemes have reported rather encouraging sales or take-up of their projects. “The residential property market is currently sluggish as speculators have been deterred by the various cooling measures implemented by the government. Genuine buyers and investors are also finding some difficulty in securing the loan quantum that they want. “Developers have to come up with schemes to attract buyers to make an immediate commitment instead of waiting until they can qualify for a loan to buy. “Incentives and marketing schemes offered by developers which help to resolve buyers’ loan issues as well as their inadequate savings to come up with the loan differential sum will definitely help to attract buyers,” he remarked. Knight Frank managing director Sarkunan Subramaniam concurred, citing past campaigns where UEM Sunrise Bhd’s Signature Selection campaign achieved RM215 million in sales while its recently concluded Signature Selection-Rendezvous in France 2016 campaign generated RM228 million in sales. He also noted that Selangor Dredging Bhd’s (SDB) Reside-and-Purchase scheme reportedly received overwhelming response. However, Henry Butcher’s Tang noted that all these marketing schemes are not without cost. “There is obviously a cost to the marketing programmes implemented by the developers and they eat into the profit margins of the developers unless they can increase their selling prices to cover these additional costs. “But to them, cash flow is important hence they have no choice but to accept a lower profit margin at this point in time when market conditions are weak,” he added. Tang predicts that property developers will continue to offer such schemes with improvisations and variations along the way to make fresh appeals to buyers. “Nevertheless, this is not something that can be sustained indefinitely and will likely stop or happen on a small scale when market recovery takes place,” he said. Meanwhile, Sarkunan said these marketing schemes are sustainable, but only to a certain extent. “Besides the strict lending guidelines, the widening gap between supply and demand as well as the mismatch in product pricing and affordability are also weighing down on the property sector — a more important issue to be addressed. “Measures and policies are needed to stimulate activities and rejuvenate Malaysia’s property sector which has slowed considerably.